FAIRFIELD — A state administrative judge on Tuesday allowed a locally-based activist group and an Athens rancher to become part of formal discussions regarding TXU Corp.’s proposal to build an additional coal-fired power plant at its Big Brown site. Judge Kerry Sullivan of the State Office of Administrative Hearings made a ruling allowing the East Texas Environmental Concerns Organization and Glenn Brinkman, who lives in Athens but owns ranch land in Anderson County about 16 miles from Big Brown, to participate in formal proceedings. ETECO President Margaret Rands spoke on behalf of that organization, which was permitted to participate because one of its members lives in Streetman, near Fairfield. 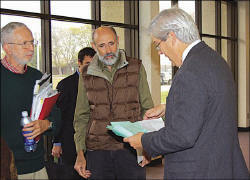 Lake Athens resident Mark Carlson, a local engineer, also attempted to be given standing as an individual in the case but was denied. TXU has proposed building 11 new coal-fired power plants across the state. In addition to the plans at Big Brown, the company also wants to build new plants in Henderson and Mount Pleasant. Some Henderson County residents oppose the projects, saying the plants cause pollution that blows into their environment. TXU has applied for air quality permits from the Texas Commission on Environmental Quality. Administrative judges are presiding over the hearings, with the intent of listening to objections from the public over the proposed expansions and then making a recommendation to TCEQ about whether to grant the permits. Hearings were held in the cities of Mount Pleasant and Henderson Monday. Tuesday’s hearing was attended by about 125 people on both sides of the issue, including TXU supporters and officials from various groups, including the Sierra Club, Environmental Defense and the Sustainable Energy and Economic Development (SEED) Corporation. From time to time, Fairfield High School classes were ushered into the auditorium’s balcony to watch the proceedings. Many opponents said they don’t want to halt TXU’s expansion at Big Brown. Instead, they said they want the company to consider environmentally-friendly power-generating alternatives. The coal-burning method, those opponents say, is pumping tons of pollutants — including nitrogen oxides, sulfur dioxide and mercury — into the region’s environment. TXU officials say the company will double its coal-fueled power supplies with the 11 new plants while reducing key emissions 20 percent. TXU media relations representative Tom Kleckner, in a letter to the Athens Review last week, said the company has filed a permit to install additional emissions control technology at its Martin Lake facility in Henderson. Similar announcements for its plants in Fairfield and Mount Pleasant are expected before the end of the year, Kleckner said. He also said TXU is investing nearly $2 billion to commercialize state-of-the-art “clean technologies,” including forming a $200 million energy venture fund to invest in technologies such as coal gasification — a process endorsed by some ETECO members — carbon removal retrofits and new nuclear generation. During her testimony, Rands said she is concerned that pollution levels on Lake Athens are only checked every couple of years. “If we had more monitoring of our lakes, we may find we have a bigger mercury problem than we know of,” she said. She also said ETECO members are very concerned about climate changes in the region. A steady increase in summertime temperatures and mild winters are likely the result of global warming, she said. Tuesday’s hearing was held less than 24 hours after the City of Athens joined the Texas Clean Air Cities Coalition. That coalition will ask for standing in the case at a Dec. 14 hearing in Austin. State Rep. Betty Brown, who represents Henderson and Kaufman counties, has also joined in the conversation regarding the proposed plants. Brown was among a bipartisan group of 25 state legislators who signed a letter on Nov. 20 asking TCEQ to delay the process of approving permits “until a more detailed analysis of their impacts can be ascertained.” Brown’s Henderson County director, Amy Gould, attended the meeting. ———Local residents Bob Renk, left, and Guy Anderson, center, turn in forms to speak during Tuesday’s meeting at Fairfield High School. Pictured at right is Administrative Judge Kerry Sullivan.